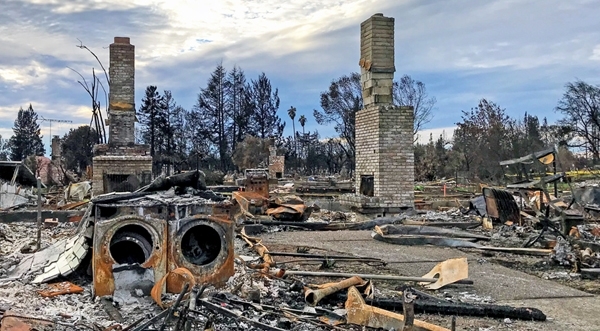 In a Santa Rosa neighborhood, all homes were burned down to the foundations with only things like fireplaces, washer dryer sets, and car frames left. Photo by Faith Kearns. From ecosystems to housing, fire and water issues are deeply connected. That lesson keeps coming home again and again in California this year, most recently with the Thomas, Creek, Lilac, and several other fires in the southern California, as well as the Tubbs, Redwood, and related fires that happened in Sonoma and Mendocino counties. After years of drought, a wet winter that led to lots of summer-dried vegetation, and some very high winds (among other factors), many thousands of California residents are being deeply affected. In addition to working here at the California Institute for Water Resources, I spent several years working at the Center for Fire Research and Outreach at UC Berkeley with many well-known fire research and extension experts including Max Moritz, Scott Stephens, Steve Quarles, Bill Stewart, Susie Kocher, and others. Most of us have spent at least some time on cross-over water and fire issues precisely because of their inter-relatedness. As just one example, Steve Quarles has done some of the most interesting and foundational work in the state, and really the country, to understand how houses burn down from fires, and how we might help them, well…not. He started his career working on water issues related to wood home construction and quickly learned that there are trade-offs involved with keeping both water and fire from ruining houses. Wildfire and water are interlinked issues in everything from housing to ecosystems. On the left, only a staircase remains from a home in Glen Ellen. On the right, burned oak woodland in Sonoma Valley Regional Park. Photos by Faith Kearns. “The love in the air is thicker than the smoke” is a frequently heard phrase in Sonoma County in the wake of the Tubbs and related fires. Photos by Faith Kearns. In addition, sparked by some of the frequent remarks about the “randomness” of fire destruction, I wrote an article for The Conversation (republished by CBS News and others) about how much we do actually know about how houses burn in wildfires. It links to a lot of the tools that we developed at the fire center a decade ago, which (despite the outdated graphics) are still some of the best science-based resources out there. With both fire and water in California, there are some very fine needles to be thread. For example, fires and droughts have always happened, but these most recent fires are very much out of season, and they do seem to be directly affecting a larger number of people because of where and how we live. At the same time, a disaster for a human community may not be for an ecosystem. It is a challenge that all of these things are true at the same time. But, as always, with challenge comes opportunity.